The Duke and Duchess of Cambridge were spotted at Wimbledon today to cheer on Andy Murray during his quarterfinals match. Kate looked lovely as ever, wearing a bright red LK Bennett dress, her foldaway Ray-Ban wayfarers that we saw during the royal tour Down Under, and carrying a DVF clutch. But as gorgeous as this red dress is -- can we talk about how on point her hair was? She took a glossy blowout to a whole new level! 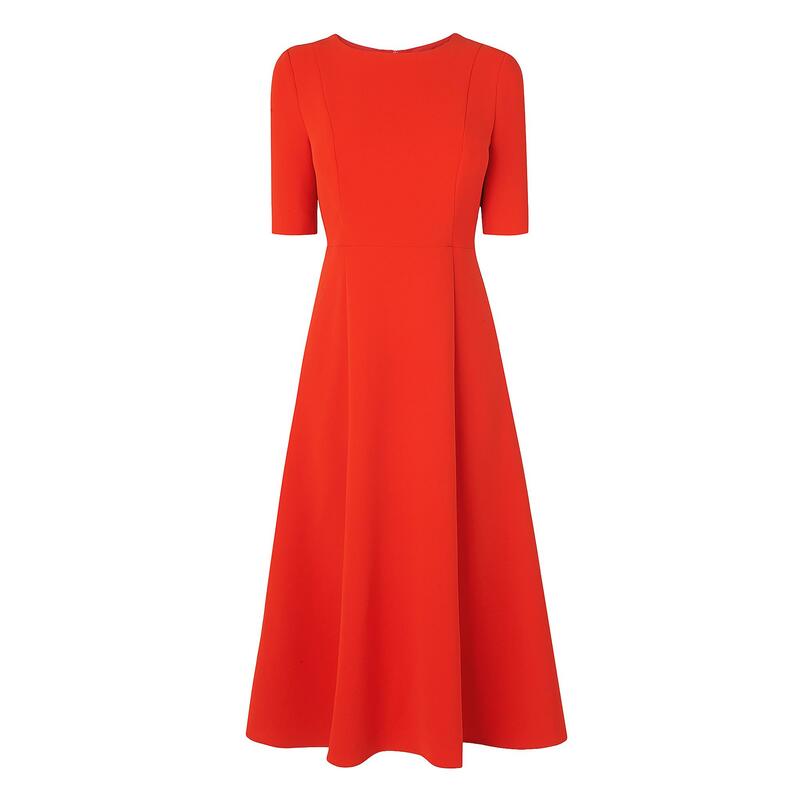 Kate's latest style pick, the Cayla Long Dress in crimson is still available at the LK Bennett website for £250.00 (about $385) -- but act now, it's selling out fast! She also carried her leopard print clutch by Diane von Furstenberg (similar style here) that she has had for a few years. See more detail on the Cayla Dress below. Click through below to see more photos from Kate and William's day at center court. Kate and William take their seats with Philip Brook, chairman of the All England Club, in the royal box on centre court. The Duchess of Cambridge arrives for Andy Murray's quarterfinals match of the Wimbledon Championships. The Duke and Duchess applaud Andy Murray with Sophie, Countess of Wessex during their day at Wimbledon. The Duchess wore a vibrant red dress by LK Bennett for the match. Kate and William share a laugh during the match. Andy Murray's tennis game: Great. Duchess Kate's hair game: ON. POINT. The Duke and Duchess looked quite glamorous for their day date at Wimbledon. The Duchess chats with All England Lawn Tennis Club Chairman Philip Brook. Kate and William applaud after Andy Murray beats Vasek Pospisil during day nine of the Wimbledon Championships, advancing to the semifinals. Kate and William react during the match.